Construction dewatering are terms used to portray the act of removing groundwater or surface water from a construction site. Usually the dewatering process is done by pumping or evaporation and is generally done prior to excavation for footings or to lower water table that might be causing troubles during excavations. Dewatering can also refer to the process of removing water from soil by wet classification. Construction dewatering is employed on nearly all construction sites owing to amassed water in trenches and excavations or in places with insufficient slope or high water table. In construction projects, this water should be removed to keep working as planned or to offer a safe workplace. Generally, builders are likely to use water pumps to dewater these regions, but if they are not paying attention to the place where water is discharged, erosion and other problems may happen. It is vital to follow best management practices when water is being pumped to lakes, wetlands or directly to storm sewer inlets. Dewatering activities must be done right to steer clear of eroding the soil on the construction site. It is also essential to select the best location for discharge, even when you might be far away from water bodies or catch basins. There are numerous dewatering products that can be used to get rid of sediment from the pumped water, such as dewatering bags. Water should not be pumped directly into slopes. 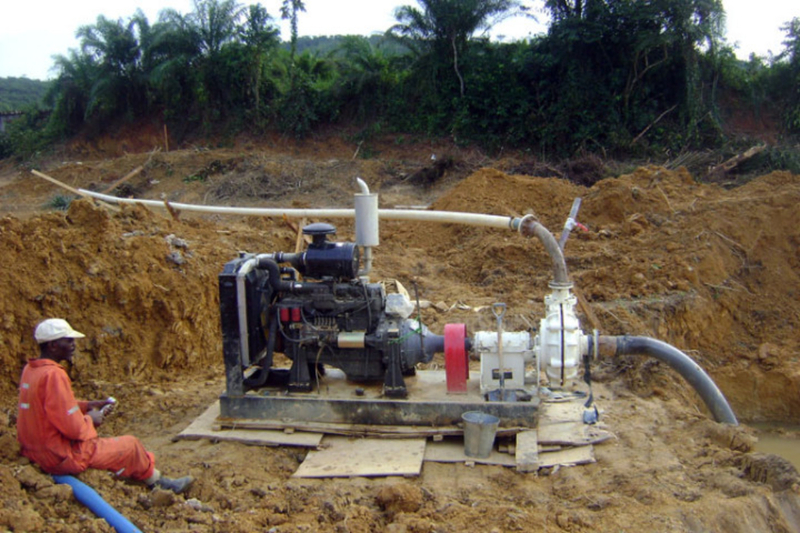 Dewatering activities should be bound for a wooded buffer, if available. It is significant to pay special attention and discontinue dewatering if the region shows signs of instability or erosion. Channels used on dewatering must be steady and better if they have been protected with grass or vegetation. You should steer clear of dewatering under heavy rains because the infiltration rate is at a minimal and water will move slower or just the dewatering process will not function. Never discharge water that has been contaminated with oil, grease, chemical products directly. In such instances, an oil/water separator may be necessary. Supplementary permits and requirements might be needed from state, local, or federal agencies. Dewatering bags are made of durable geotextile fabric used to filter water by removing sediments. Dewatering bags are used on dredging operations, construction sites or places with high water table near the shoreline. These bags should be sized based on the pump flow rate and type of sediment. When using dewatering bags avoid numerous pipe discharges as it may cause the filter bag to fail. Remember to manage water runoff correctly by guiding it to the nearest storm inlet. Construction dewatering from open excavation or trenches can be done by numerous methods. Nevertheless, the most simple of all is gravity drain using drainage channels carrying away water from the region to be worked to the discharge point. Further practical ways for dewatering are water pumping, siphoning and/or using large construction machinery buckets to scoop and dump water from the chosen region. Earth channels used for dewatering could also be protected with ditch linings, and extra protection should be placed to decrease water velocities and reduce erosion. It is suggested to assemble rip rap revetment protection with geotextile to avoid further erosion at the discharge point. When it is known that a low permeability soil can be found, a likely solution to decrease the construction dewatering process is separating the permeable strata from other sources of water. Sometimes, sheet piles, slurry walls, and grout curtains can be used as a method of avoiding water from entering into you trench or foundation. Although this solution will not get rid of the problem, it is a very good plan to use when water table is high, as you will still need to pump or get rid of water from the foundation or trench owing to rainfall and water trapped in the area. Depending on the system use, a total engineering analysis will be necessary to analyze how this process affects other regions. Thank you for pointing out that when it comes to dewatering, water should not be pumped directly into slopes. Hopefully, this is something people take into consideration when hiring professionals to dewater for them. I would hope that people would find the best dewatering services in their area.